K-Line Industries breakthrough in trash management comes in the form of the simple, fast and efficient Trashcutter model. 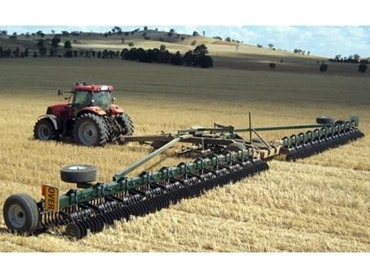 The system uses low horsepower to keep soil disturbance at a low. Trash will be laid across the front of self sharpening coulters and then cut and spread evenly on the soil surface. With an adjustable angle and a down pressure, the Trashcutters patented design means that the stubble is laid to one side. The trash is managed by being sliced into shorter lengths with self sharpening discs. With more of the stubble crown staying in the soil, stubble retention helps to prevent wind erosion and also will help the soil increase in organic matter.